Eucalyptus ear candles are 10" long and approximately 1/2" in diameter. They are made with unbleached muslin and food grade wax and are aromahanced with eucalyptus essential oils. Candling has been passed down through generations of families around the world and they all agree candling is a rewarding holistic remedy. Harmony’s Candles, well known for producing the best handcrafted candles in the world because of years of unparalleled research, wants you to learn more about candling and how it can help you and those you love. Here you’ll find helpful tips, links, and other information to help you determine if this modality is right for you. Harmony’s Candles are helpful, natural, and sold only in the finest natural health stores. See the difference in our craftsmanship, high-quality candle materials, and superior service. We are your choice for premium candles! Before using Ear Candles, read the instructions below. Cut a cross in the center of the paper plate big enough to put the small end of the candle in snugly. Push the candle far enough through the plate so it can be placed in your ear. Lie on your side and pull the hair away from your ear. Light the Ear Candle and while gently holding the candle between your fingers, place the small end of the Ear Candle in your ear ensuring it is well seated in your ear. Allow the ear candle to slant naturally, following the angle of the ear canal. When the candle has burned down 6", take the candle out of your ear and extinguish the flame in the glass of water. Clean the outside of the ear with the Q-tip and if you like, massage a couple of drops of Mullein, Garlic, or Olive oil in your ear. Please use Ear Candles ONLY with the supervision and/or assistance of another person. Made in the USA! Never a copy, or cheap imitation . . . and never imported from China. The longest running, single owner company in the United States. Handcrafted by single moms, homeschooling families and those with disabilities. The only candle company with a patented safety tip designed to protect you and increase the vortex. NOT a cheap imitation stuck in a candle! Ready to use! No need to cut open a tip or pull out an incense stick. With over 20 years of actual hands-on experience, Doc Harmony has personally candled over 10,000 people! Highest quality food grade wax available for the safest and cleanest burning candle on the market. Top Grade Muslin cloth utilizing 53 sq. inches vs. the competitor’s skimpy 10-32 sq. inches. Our candles create a sturdy, longer and safer burn. No need to cut ashes with our candles! e ONLY candle in the USA with a burn line label and directions, ensuring consumer safety. 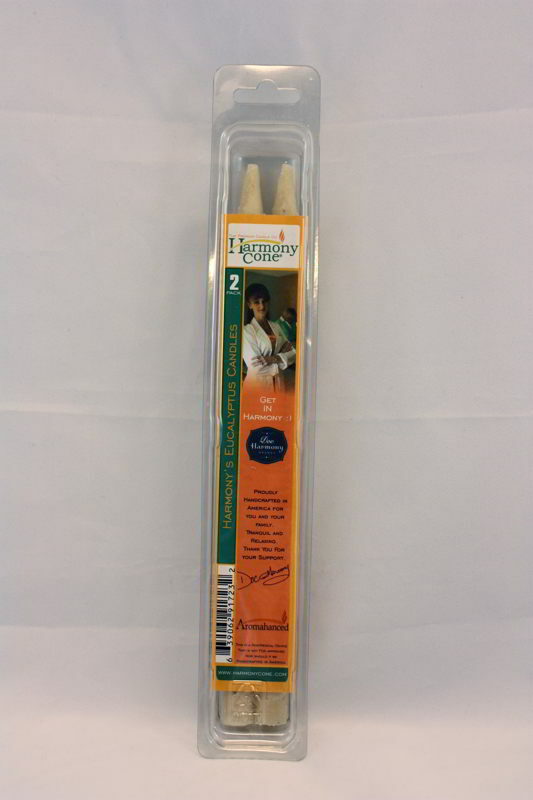 e LARGEST variety of high quality aromatherapy candles. Good Manufacturing Processes implemented by a former FDA agent, ensuring accountability from raw materials to the consumers’ hands. $1 Million dollar liability policy. Unparalleled research categorically and legally. patented safety tips created from PLA (Corn Starch).